One of the most surprising bits of news to hit the Haunt industry this year was Elvira’s announced return to Knott’s Scary Farm after being absent from the park for over 10 years. Elvira had become a staple of Halloween Haunt had quickly helped propel Scary Farm as being one of the top theme park events on the planet. This year she is back with a brand new show “Elvira’s Sinema Séance”, and will be hosting meet and greets inside the park shortly after each show nightly. 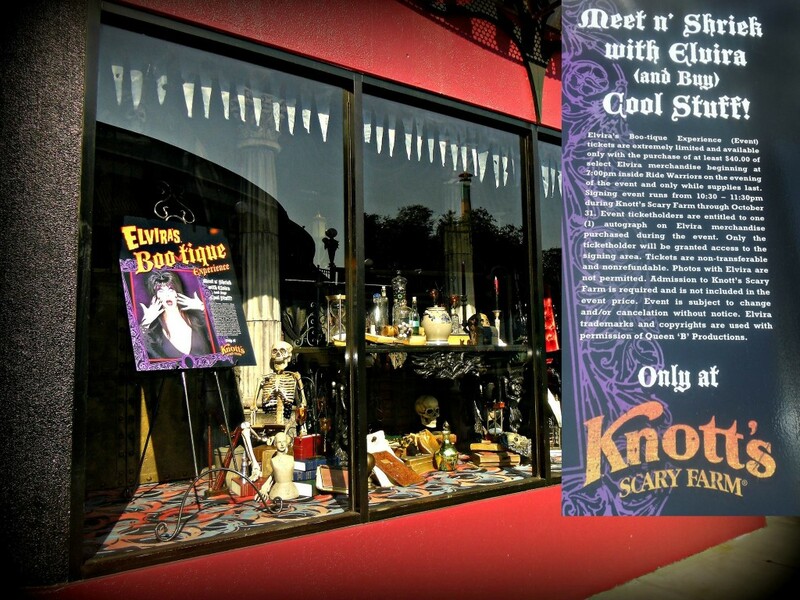 To celebrate the return of Elvira, Mistress of the Dark, to Knott’s in 2013, we’re inviting all aspiring Elvira wannabes to dress the part and come to Knott’s Scary Farm on Saturday, October 5 for a chance to strut your stuff. For one night only, Knott’s will break its “no costumes” rule just for guests dressed like Elvira for this special event. The look-alike contest will take place at 10:00pm on the Calico Stage in Ghost Town. One grand prize winner will receive two tickets to come back to Knott’s Scary Farm again in 2013 on the night of their choice. Please note: Valid admission to Knott’s Scary Farm is required. Only Elvira costumes will be permitted. No masks or weapons permitted. Knott’s reserves the right to determine whether Elvira costumes qualify for admittance/contest participation. Knott’s Scary Farm is not recommended for guests under 13. Event re-entry is not permitted. For more information, here is a clip of from the Mistress herself. In addition to the look-a-like contests guests can also purchase a bit of Elvira herself. 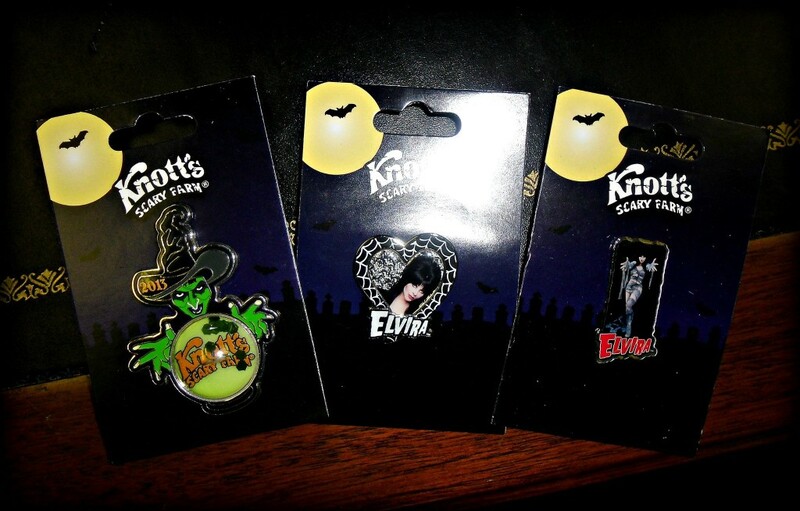 Exclusive Knott’s Scary Farm Elvira pins have been revealed. Pin trading is slowly adapting itself from Disney to other parks around the country. Scary Farm will be no excepting introducing limited edition Elvira themed pins. Fans of the Mistress will surely want to pick these up. 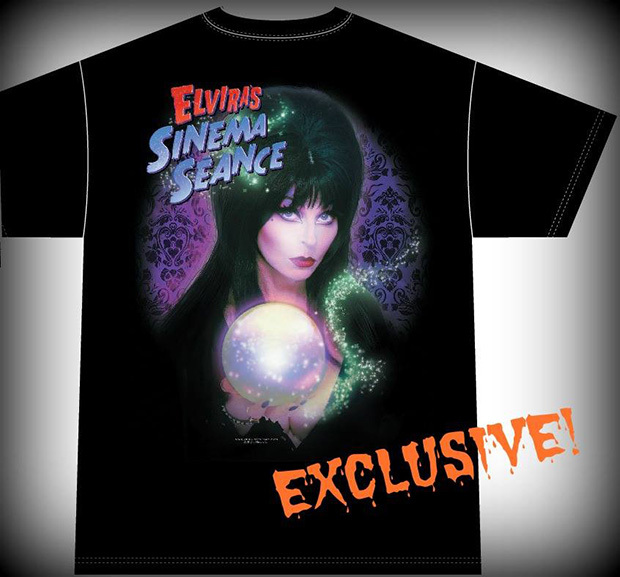 Her new show Elvira’s Sinema Séance will also be having a bit of merch itself including this exclusive t-shirt. Or perhaps if you a few more spare bucks, you can quite literally take Elvira home with you, in 1/6 scale of course. Knott’s Scary Farm 2013 is proud to present a limited edition Scary Farm edition of this amazing Elvira Maquette from Tweeterhead – our version has a different base and plaque with our Knott’s Scary Farm logo on it, plus a Certificate of Authenticity. Each statue’s Dagger and Ring are made with Swarovski Crystal Elements! Each statue will be hand numbered! Plus, by purchasing this at the Elvira Boo-tique, you can have it hand signed by the Mistress of the Dark herself! These will be available starting 9/26/13 at Knott’s Scary Farm exclusively at the Elvira Boo-tique. Be the first on the planet to take one of these wicked beauties home with you. It’s sure to be the centerpiece of your collection…she’s to die for…. Remember, there are only 50 of the Knott’s Scary Farm Exclusive Edition available – don’t delay or you’ll be terrified to learn it’s too late! Now that’s scary! $349.00 – a small price to pay to take a legend home with you…. This is an absolute must have for any die-hard Elvira fan, no where else can you purchase this statue and have the opportunity to have her sign it herself. These are almost certain to sell out very quickly. Wondering where to get all these goodies? The Ride Warrior Shop in the boardwalk section of the park is quickly being transformed into Elvira’s Boo-tique Experience. Knott’s Scary Farm unveils Elvira’s last show, and new house details for 2017!